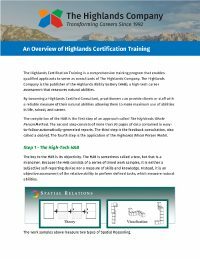 Complete the Highlands Certification Training program to provide the Highlands Ability Battery (HAB), to benefit your clients including students, leaders and employees of organizations. 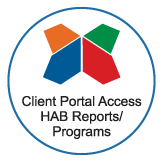 The Certification program reviews the intricacies of our proprietary HAB technology, the philosophies behind the Highlands Whole Person Method, and best practices for providing individual and group feedback to clients. An opportunity to take the HAB and receive your own reports and debrief. 16 hours of initial training on the Highlands Whole Person Method. Ongoing professional development as part of your certification. Your own listing in the Highlands online consultant directory. Resources to assist you in the development and marketing of your business. An invitation to be part of an elite community of practitioners who work to transform the careers of students, adults, and business leaders worldwide. Many Highlands Certified Consultants rely on The Highlands Company to run successful private consulting firms and company departments, including Alan Kearns of Career Joy, Canada’s Career Coach; Dori Stiles, who works with the University of Georgia; and Maura Koutoujian of Jody Michaels Associates, just to name a few. For articles featuring the work of some of our Consultants, click here. 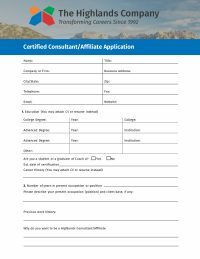 You can see a listing of every Highlands Certified Consultant in our online directory, but, generally speaking, professionals in the following fields often get certified in the Highlands Method. The Highlands Certified Consultant Training is accredited by the International Coach Federation for 32 hours of continuing education credits in the following areas; Core Competencies 14 hours, Resource Development 18 hours. You will set yourself apart when providing a richer, more objective career guidance program for your clients, complete with careers to explore. Want to see it for yourself? Take the HAB through The Highlands Company. We offer discounted rates to practitioners, contact us. For more information or to register for training; download and review the following documents and submit the inquiry form to the right. 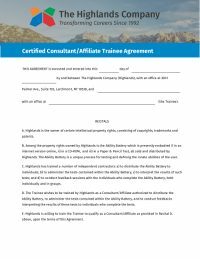 Once accepted, sign this agreement one week before training. Your information will be kept confidential and not shared with any third party. Which of the following groups do you work with?